Astrology & Terrorism: The 3 June 2017 Terrorist Attack in London – a straight attack on the outcome of the 8 June general election in the UK. I have the impression that the attacks were planned and carried out to support the Brexit supporters in the coming election. A short astrogeographical analysis. The terrorist attack on 3rd of June 2017 was the 3rd major pseudoreligious fascist islamistic attack in the United Kingdom in 3 months following the 22 March Westminster attack and the 22 May Manchester Arena suicide bombing. These three attacks were the first fatal islamist terrorist attacks in the United Kingdom since 2013. The timing of the three 2017 attacks was such that they were directly related to the process begun by Prime Minister Theresa May`s application for the United Kingdom`s EU Brexit on 29 March 2017. 3 weeks later on 18 April 2017 May announced her plan to hold general elections on 8 June 2017. Especially the 22 May Manchester Arena attack and the 3 June London attack appear to have been carried out to directly influence the UK General Elections. In regard to the outcome of the elections. The most probable intention of the attacks on the decision of britsh voters must have been the support for the extreme nationalist and/or conservative parties namely UKIP and Theresa May`s Conservative Party. The question arises which global political players are so deeply concerned with influencing the British elections through sending out pseudoreligious contract killers. The list of islamic countries known to be involved in the organisation and payment of islamistic suicide killers under the roof of the Islamic State (IS) is not too long: Saudi Arabia and the sunnite arabian gulf countries are the most important among them. As the 22 May Manchester Arena attack occured only 2 days after Donald Trump`s weapon deal visit to Saudi Arabian capital Riyadh on 20 May a direct relation between the renewed Trump-Saudi alliance and the Manchester attacks is therefore obvious. I want to remind all readers that Trump even promised to help the Sunnite alliance of the IS supporting countries against their most important regional enemy: Shiite Iran. In fact I feel too disgusted to try and mistify the single attacks through much astrological speculation. I have discussed before what I believe needs to be understood about the roots and reality of pseudoislamic terrorism. I believe that it was created as an alibi shield for the hypercapitalist players behnd the global political situation organized by the military superpower and its Saudi allies. Thus the current wave of terrorism spread over Europe is a continuation of the US politics installed under George W. Bush through the US/British occupation and destruction of Iraq by then Saudi Arabia`s strongest enemy in 2003. So I`m trying to keep the astrogeographical interpretation short: yes the attack comes during the longer period of the Uranus transit in opposition to coordinate one (24° Libra) and a square to coordinate 2 (27°Capricorn) of London which began in May 2016 and will last until March 2019. For a fuller explanation compare my article: The astrogeographic position of London, the national charts for Great Britain and an outlook on future planetary transits. The similarity between the astrological event charts for the Manchester Arena attack and the 3 June London attack is striking. Both have Sagittarius ascendant with its ruler Jupiter in house 9 and Uranus which through his square and opposition transit is indicator for the current process in british history conjunct the IC. Mars in Gemini in house 7 in both cases indicates that the aim of the attacks is spreading thge information of warfare. And also in both cases Mercury the ruler of Gemini and of Mars`s position was located in Taurus between house 4 and 5 indicating the aim of staking territorial and financial claims through action dedicated at direct profits. Especially Mercury`s position in house 4 indicates local support from inside the UK. The conjunction of Venus the ruler of midheaven and sign ruler of Mercury in Taurus with Uranus as indicator for the Brexit decision in both cases is a clear indication that it is a major aim of the attacks to support the Brexit supporters in the coming elections. Astrogeographically the grand trine between Uranus, Saturn and the North Node of both attacks is a clear hint that they were carried out in favour of the current US government. 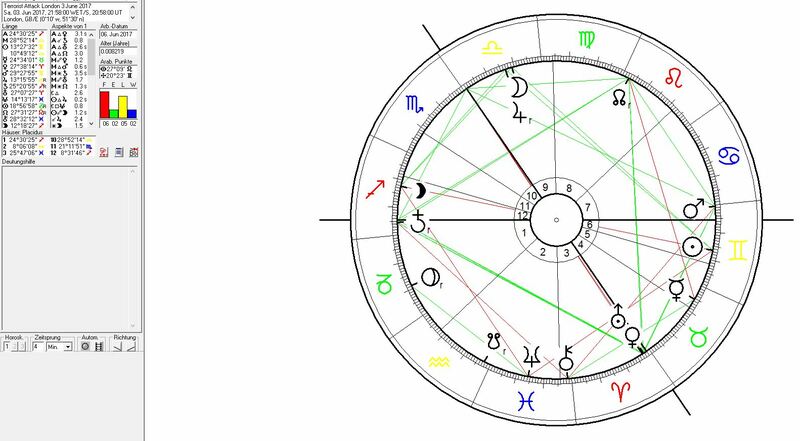 This is because the North Node – indicator for the motives of the attack was exactly conjunct the astrogeographic position of Washington at 27° Leo as well as Mars and the ascending degree in Donald Trump`s birth chart. 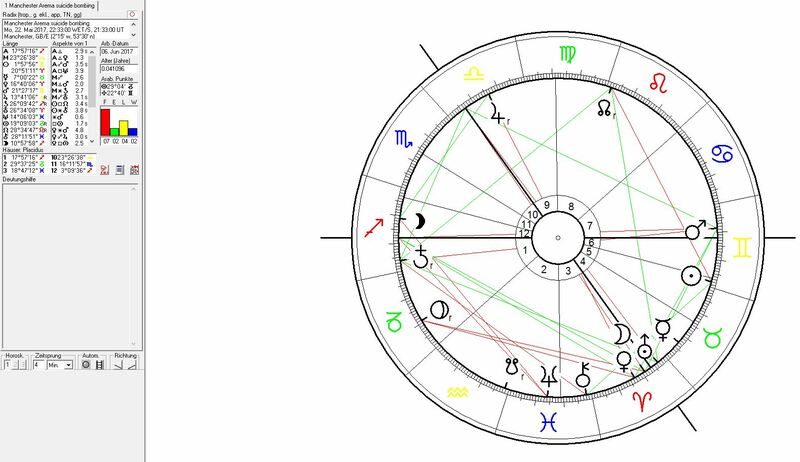 The astrogeographical position of the Saudi capital Riyadh on 21°Leo is also triggered by this Grand Trine in the fire signs though to a smaller extent. Astrogeographic position of London for morphogenetic field level 1 which shows the supraregional and international resonators of the british capital and government: London is located at 24° in aristocratic, courtly air sign Libra and 27° in conservative, hierarchical earth sign Capricorn. 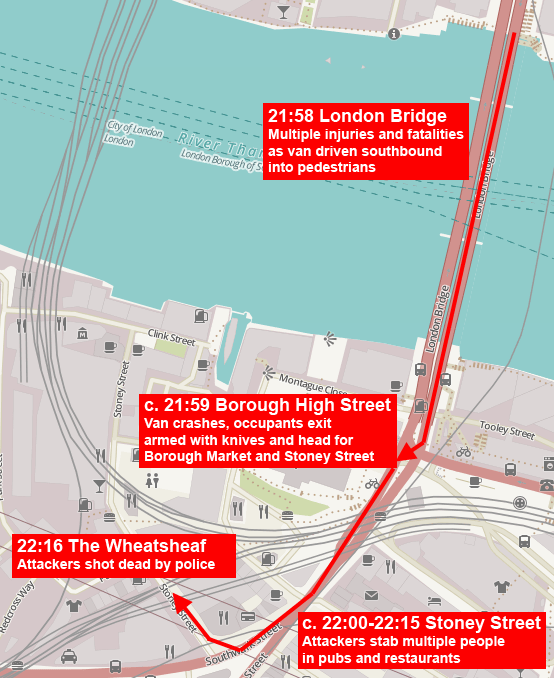 An examination of the chart of the London attacks in regard to the personal motives of the 3 contract killers brings out the heavily digusting side of their personalities. The Moon-Jupiter conjunction in Libra in house 9 must be compared to a gaming and having fun attitude as in a hunting party. Even more so because it is combined with Mercury in house 5 the house of self-esteem, playing, enjoying and gambling.